During the years of the Great Depression the popularity of walking in the Blue Mountains revived. The impact of the motorcar had deflected interest away from the old walking tracks until the general decline in prosperity meant that hiking guides replaced motoring guides as sources of popular recreation and visitors to the Blue Mountains began to rediscover the bush. With the increasing popularity of bushwalking, the early 1930s also saw the emergence of the modern conservation movement. Myles Dunphy, who began walking in the Blue Mountains before World War I, had been influential in forming the Mountains Trails Club in 1914. The members of this club, and the Sydney Bushwalkers Club founded in 1927, had a different view of walking from 'tourist' walkers – the mainly family groups who strolled the well-maintained tracks close to the townships. Dunphy and the Mountain Trailers marked the beginning of a new era of walking in the Blue Mountains. Their emphasis, while still recreational, was on developing the skills of bushcraft, self-reliance and adventure. Earlier walkers who yearned for such elements as part of their walking experience would tramp the Six-Foot Track, the bridle path opened in 1884 to link Katoomba and Jenolan Caves. The new generation of walkers, the 'bushwalkers', left the well-marked tracks and headed into the rougher country, often charting new routes for their comrades to follow. Public concern for the preservation of the natural environment was sown among the bushwalkers. On the Certificate of Membership of the Mountain Trails Club the following words appeared: "remember a good bushman is a fellow you will surely want to trail with again. You were not the first over the trail; leave the pleasant places along the way just as pleasant for those who follow you." During the early 1920s, far-sighted Myles Dunphy formulated a plan for a Blue Mountains National Park, which was adopted by both the Mountain Trails Club, in 1922, and the Sydney Bushwalkers, in 1927. The Blue Gum Forest, a magnificent stand of tall Blue gums growing in the Grose Valley neat the junction of Govett's Leap Creek and the Grose River became the subject of what many consider the seminal conservation campaign. Beginning in 1931, it was conducted by those whose environmental concern was nurtured in the bushwalking and wildlife societies of the time. It generated considerable interest and co-operation, pointing the way for successful future action. The story of the campaign begins with a chance meeting which occurred during the Easter holidays of 1931, when a group of bushwalkers led by Alan Rigby entered the forest of Blue gums and encountered two men prepared to ringbark the trees. One of the men explained that he had leased the area and planned to replace the blue gums with walnut trees. The walkers were appalled. Those beautiful gums at the site of Eccleston Du Faur's 1857 Junction Camp, circled by soaring sandstone cliffs, were to be destroyed. Surely the authorities had made a mistake in granting a lease for this purpose. It was a situation that required some fast thinking so, boiling the billy; the walkers discussed the matter over lunch. It was proposed to seek time to place the issue before the full membership of their bushwalking clubs. There must have been persuasive talkers in the group for the lessee, assured that it would be to his profit, agreed to postpone the ringbarking for the time being. Returning to Sydney, Alan Rigby got things moving with a full report to the next meeting of the Mountain Trails Club. The upshot of this was a request to the Sydney Bushwalkers to assist in a campaign to save the Forest by buying out the lease and ensuring the area be reserved for public use. When the sanction of the Lands Department was obtained the first step was successfully accomplished. The most difficult task still remained, to raise the one hundred and fifty pounds required by the lessee, C A Hungerford of Bilpin, to allow him to obtain an alternative site for his walnut trees. Their agreement called for fifty pounds to be paid by November 1931, with the balance spread over the following twelve months. A Blue Gum Committee was established to co-ordinate the campaign. Donations were solicited and fund-raising dances and socials were organised. In a time of economic depression, meeting the lessee's terms proved a difficult job. On Sunday 15th November, a meeting of the committee and Mr Hungerford took place to assess the matter. It was held at the site among the mighty blue gums whose future was in the balance. Myles Dunphy, a member of the co-ordinating committee, has written about this important gathering. "The business meeting, about midday, was held in pouring rain; the members of the party sat around in a circle in a space between the trees. Each shrouded in a cape. The weather was unkind, but the great trees standing up all around appeared magnificent – except one fine specimen which lay stretched out close to the riverbank, a victim of the lessee's salesmanship. No doubt it was felled to give point to the necessity for saving the trees." The meeting resulted in new terms being settled which required payment of a reduced total of one hundred and thirty pounds by the end of December. The committee channelled its energy into a renewed effort and a donation from the Wildlife Preservation Society allowed an immediate deposit to be made. With the assistance of an anonymous loan to supplement the amount already raised, the deadline was met. The united action of the bushwalking societies and numerous other supporters had secured a beautiful piece of bushland for public use. The Blue Gum Forest was notified as a public recreation reserve on 2nd September 1932 and a management trust appointed. In 1961 the area was absorbed into the Blue Mountains National Park. In 1931, the same year that the Blue Gum forest campaign was being waged, Mules Dunphy formed the National Parks and Primitive Areas Council (NPPAC). Adopting the slogan 'Progress With Conservation' and made up of representatives of all the major bushwalking clubs of the time. The Council set about promoting Dunphy's plan for a Blue Mountains National Park. In August 1934 it published a four-page supplement to the Katoomba Daily in which the idea was presented in detail and Dunphy's beautifully drawn map of the proposal was reproduced. Six thousand of these supplements were distributed throughout the Blue Mountains and Sydney. It still took more than two decades before the plan achieved and kind of reality. The Blue Mountains National Park, comprising much of the central part of the original plan was gazetted in September 1959. Over the next twenty years, as a result of intense campaigning on the part of conservationists, further large areas of the Blue Mountains region, including Kanangra-Boyd in the south and Wollemi in the north, were dedicated as national park. By the end of the 1970s, the vision of the early bushwalker-conservationists had been vindicated and most of the areas covered by the NPPAC proposal had been secured for public recreation. On Monday 2nd November 1931, a special cricket match took place at Blackheath between teams representing the local community and Lithgow. Organised by the Blackheath Municipal Council, the event was used to christen the newly installed malthoid wicket, the first of its kind in the Western Districts. 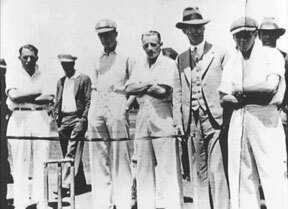 The Test players Wendell Bill and Donald Bradman were specially invited to represent Blackheath in the local team. Few in the crowd could have known what a memorable match it turned out to be. ‘The Don’, in his own words, “had a day out” and what a day it was! In one three-over period, in which he faced 22 balls, Bradman hit 10 sixes, 9 fours, a two and 2 singles, running up what was probably the fastest century ever scored. He was finally caught on 256, an innings that ensured a Blackheath victory. The bat Bradman used in the match was later given to the Blackheath Mayor, Peter Sutton, who had it mounted on the wall of the Council offices in Blackheath. A story survives that he occasionally asked people to swear on it when a truthful response was required. In 1912, only a few years since rugby league had arrived in Sydney from its birthplace in the north of England, the little village of Glenbrook in the lower Mountains fielded a team in a local competition that included Emu Plains and Penrith. The large population of railway workers in Glenbrook at the time, working on the deviation through Glenbrook Gorge, no doubt provided the impetus for the town's early adoption of the game and the Glenbrook Rovers do not seem to have survived their departure when work was completed in 1913. Three years later, in 1915, rugby league teams were formed in Katoomba and Springwood. The Katoomba club was formed under the patronage of James Joynton Smith, the owner of the Carrington Hotel and an influential supporter of the game in Sydney. It entered a team in the competition administered by the Hartley District Rugby League and, despite some controversial off-field tactics by the "Kaisers of Lithgow football", ended the season as premiers. Springwood, on the other hand, played in a Sydney 'Western Districts' competition and finished the year with six wins from twelve matches. World War I, however, disrupted the development of the game in the Mountains and a truly local competition did not eventuate until after hostilities ceased. The Blue Mountains District Rugby League was formed in 1920 and a trophy was donated by Katoomba businessman John S. Henderson, a co-patron of the League with Joynton Smith. The first season produced a final between Springwood's 'Springboks' and Katoomba's 'Federals' that, according to the local newspaper, "metamorphosed the quietude of the bush into a veritable pandemonium". This augured well and, while the health of the local competition over the next two decades became a year-to-year proposition, its best seasons saw teams from all over the Blue Mountains do battle each week. In 1921 a Western Districts competition, involving teams from Dubbo, Wellington, Parkes, Orange, Bathurst, Blayney, Lithgow and the Blue Mountains, was initiated with the establishment of the Western District Rugby League Football Association. As the 1920s progressed, the combined Blue Mountains team, known to its fans simply as the 'Blues', began playing an increasing number of metropolitan club (generally lower grade) and company teams alongside its commitment to the country competition. The 'Blues' provided one of the few mediums through which the people of the Blue Mountains, characterised by a divisive geography of small parochial towns with entrenched traditions of rivalry, were able to express a sense of regional unity. Indeed, with the fluctuating fortunes of the local competition, the 'Blues' gradually came to occupy centre stage. One the Blue's star players for many years was Aboriginal winger Jackie Brooks whose "sparkling play brought down the house again and again". He was speedy, had "a bit of pace in reserve" and was also a capable defender. This "spectacular little winger", as one sports writer summed him up, was a popular identity in Katoomba and worked for a number of years at both the Hydro Majestic and the Carrington Hotels.